With no controller in the way you can live out the ultimate “Star Wars” fantasy. Stunning visuals transport you into the worlds of many of the movies, complete with the iconic characters, vehicles, ships and droids that you’d expect. Fulfill your destiny as a Jedi, pilot iconic ships and Speeder Bikes, race Pods, and much more. Share the fun with friends through co-op and competitive modes. With multiple difficulty levels playable simultaneously, fans of all levels can enjoy the game together. I highly recommend this game for any kid, content is appropriate, and gameplay is fun, really really fun. See it for yourself. I am impressed at how much my kids get benefit from this game, specially in motor skills, coordination, balance, discipline, self control. I bought this game for my kids, who played through Lego Star Wars, followed Clone War series, and loved to battle with other kids using the light saber toys. Like any “teen” rated games and movies, I do the screening since my kids are pre-teen. This review is based on me playing almost 3 hours finishing the story mode (campaign mode), and about 1 hour on other features. And I swear I nearly popped my shoulder twice swinging too hard! The story mode is branched off from the prequel trilogy, sometime within the Clone Wars. It starts with basic training and then gets on with the action. You can start as a “Padiwan” or “Jedi”. In Padiwan mode, if you die in a battle you get re-spawned immediately and continue battle without restarting from a checkpoint. This is obviously designed to minimize frustration and keep the momentum of the story. The battle with enemies can be on a spaceship or on planet surface. There are no shortage of space and land vehicle battles as well. The actions are almost non-stop. The most resting time I had are during longer cut-scenes and loading next chapter. This story mode reminds me of Time Crisis series on PlayStation consoles. When finished battling one section, the story automatically “fast forward” and take you to the next area, even though that next area is few foot steps away. There is no full directional movement options with your body or use of a physical controller. The story mode is good to go through once or twice. But after that, I think most people will just go to battle in the Duels of Fate mode, race and bump in the Podracing mode, or go be a Rancor to level buildings and throw things around. The Rancor Rampage is really fun if you are in a destructive mood, and you can actually do a full 360-degree directional movement which couldn’t be done in story mode. As for the Galactic Dance Off mode in front of Jabba? Well, it’s a mini dance game with Star Wars characters in front of Jabba (first location). It’s definitely intriguing! If I have a party and use one of the Kinect Dance off games, I would love to see the expressions of the party guests when I pop this in unexpectedly! Generally, the graphics (cartoon’ish) is pretty much same of the Clone Wars cartoon series. Music is Star Wars derived. As far as controls go, it’s Kinect! The good is the ability to perform like a Jedi during battle to get that in-the-action experience. The bad? Well, typical Kinect recognition issue. With an optimal light and well calibrated sensor, I think I got 90%+ accuracy. Of course, the time Kinect doesn’t recognize seem to always be making that final strike to kill an enemy! The game is fun for me at first, but 3 hours into the story mode I wasn’t quite as enthusiastic battling the same way over and over again… Maybe after my sore shoulder recovers! I’ve seen enough of the action and the language to deem it acceptable for my pre-teen kids. I actually think the game is enjoyed most by kids, especially mine who like to participate in light saber battle. In terms of soreness/calorie burning index (if there is one), this game is up there… Not only lots of swinging, but a lot of jumping (to strike from behind). It’s not far from fitness games since player tends to over exert in battle! My two grade level kids played 1/3 of the Dark Side rising story mode so far, and they loved it. One tends to use force to defeat enemies, and the other prefers to charge, swinging lightsaber, jump, and flip. Both are difficult to pry away from the game. This game will be the favorite with their friends for sure. I got to setup Xbox/Kinect with my 3D Sharp XV-Z17000 1080p Projector on 125-inch screen. For comparison purposes, I use a PS3 for 3D blu-ray movies as well as games in 1080p mode. The main menu of this game goes into 1080p mode, but each game feature changed the display mode to 720p. For true assessment, I put my projector in native mode, which means 720p is shown at around 70″ instead of 125″. I’ve also set to the highest 3D depth option (there are low, medium, and high 3D). * Story and Duel modes: The character you are playing is clearly separated from the rest. Others moving objects have a little bit of depth (consistent with most games supporting 3D). All cut scenes/movies are in 2D, which are also normal for other 3D games. However, for this game there are a lot of short video clips (2-5 seconds) that are mixed with game play, makeing it hard to really appreciate any subtle 3D effects. Overall I don’t think 3D adds much to these games. * Rancor Rampage: in this game also everything are pretty much in-screen, but 3D depth is more pronounced. Probably because Rancor is such a big object. 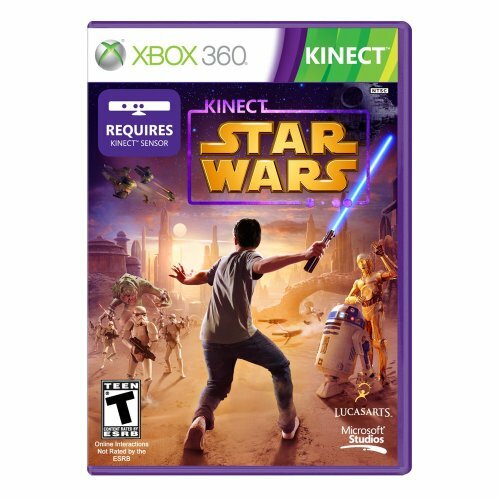 I’m a huge Star Wars fan and was so looking forward to “Star Wars Kinect.” I was a little disappointed with the responsiveness of the game to my movements, especially with lightsaber duels. The characters don’t mimic my movements at all. When I want to attack with a lightsaber, I swing my arm wildly until my character attacks. That’s about it. This should really be the best part of “Star Wars Kinect.” It’s not. The podracer pretty much goes where it should as long as my arms stay in front of me. I learned not to try to steer, because I just go the wrong way. Keep my arms in front and I run the course. My son, of course, is flailing his arms beside me, but I think I do better in the race for not having any motion at all. Not too exciting. “Rancor Rampage” is a little better with detecting my movements, but I don’t enjoy playing a rancor. We get to stomp around destroying buildings and throwing people around. It’s like being King Kong. No fun. By far the best player responsiveness happens in “Galactic Dance Off.” It’s like any other Kinect dance game, except we get to dance with Leia, Lando and Han. The dance movements are Star Wars themed. Have you ever wondered how to do the Chewy Hug or the Mynock? Now’s your chance. Of all the games, I like “Galactic Dance Off” best. On the positive side, my ten year-old son really loves this game. It gives me a good workout and he moves around more than I ever see him move with any other Kinect game. If you want your kids to get something physical in while playing video games, this would be one way to do it. “Star Wars Kinect” can be played by one player, but it’s more enjoyable with two players. It is fun to play “Star Wars Kinect” with my son, mostly because I have someone to listen to me while I complain. Just wish it was more responsive. That would make worlds of difference.